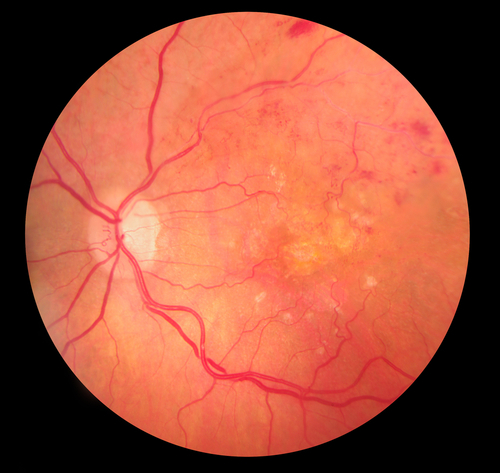 Retinal vein occlusions (RVO) are the second most common type of retinal vascular disorders after diabetic retinopathy. They can affect us at any age however most cases appear in those aged above 65 years old. Blood flows through our body in blood vessels. Each organ in your body receives nutrients and oxygen via an artery and excretes waste products and carbon dioxide through a vein. The eye is no exception. Vein occlusion is a condition whereby the retinal vein is blocked in the eye and as a result the retina becomes engorged in blood and fluid (oedema, Fig 1a and 1b). Visual blurring can range from being asymptomatic and mild to complete blindness depending on severity of the condition. This condition is of sudden onset and it tends to be painless. 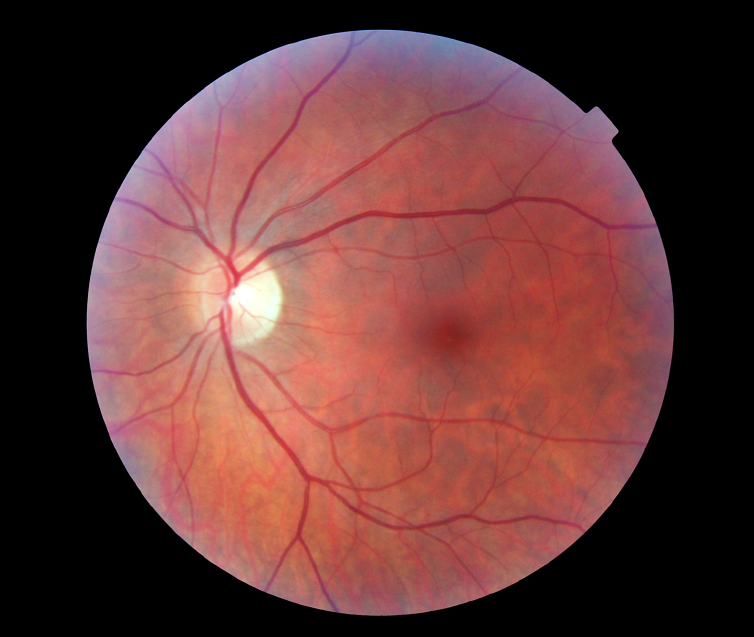 Several risk factors exist for developing retinal vein occlusion. Most common risk factors include diabetes, hypertension, raised eye pressure and increased blood viscosity. What are the different types and symptoms of RVO? Retinal Vein Occlusions can involve the main retinal vein (central RVO) or of its peripheral branches (branch RVO). In central RVO the central vision is reduced and this condition often carries a poorer prognosis than branch RVO. If the macula is not involved in branch RVO then patients often may complain of peripheral vision loss. The are several treatment options depending on the type of RVO: Intravitreal anti VEGF therapy: Lucentis and Avastin injections into the vitreous cavity have been shown to reduce oedema and improve vision. There is evidence that both these agents will prevent vision loss and in a significant proportion can actually improve vision in patients suffering from macula oedema secondary to vein occlusions. Avastin is off label and off license anti VEGF agent which works in a similar fashion to Lucentis, the licensed product for management of this disease. These injections are given monthly and usually are repeated to control the disease as the condition cannot be cured. The frequency of injections will vary between cases and will also depend on severity of the presenting condition. The anti VEGF injections have a better safety profile than other available treatments. Recently NICE has also approved Eylea for treatment in patients with macular oedema and retinal vein occlusion. Eylea works in a very similar fashion to Lucentis and Avastin. It is currently available for CRVO and hopefully soon will be available in BRVO. Ozurdex implant: Ozurdex is a preservative free and potent biodegradable steroid implant. The implant is used in management of macula oedema in central RVO and branch RVO. The implant is injected into the vitreous cavity. Studies have shown that prompt treatment with this implant is associated with better visual outcome. Side effects of this treatment includes cataract formation and risk of raised eye pressure. Intravitreal Triamcelenone (IVTA): No longer used due to side effects and development of Ozurdex. Recently NICE has also approved Eylea for treatment in patients with macular oedema and retinal vein occlusion. Eylea works in a very similar fashion to Lucentis and Avastin. It is currently available for CRVO and hopefully soon will be available in BRVO. Laser: traditionally macular laser has been the first line of treatment for branch RVO associated with oedema. Macular laser aims to help fluid resolution though it will cause retinal tissue damage as a result. This mode of treatment is starting to be replaced or used in adjunct with pharmacotherapy. Laser mainly stabilizes vision by preventing further vision decline. It often will not improve vision. It is also has no role in management of macular oedema in central RVO. Like any medical procedure there is a small risk of a complication from Anti VEGF injections. Here I have listed the main complications from the procedure, although it must be emphasised that such events are unusual and permanent loss of vision as a result of the injection is very rare. Can I have cataract surgery if I have retinal vein occlusion? There are currently no head to head published trials comparing efficacy and safety of anti VEGF agents to Ozurdex, implant, though studies are underway looking at this very issue. The choice of the agent should ideally be tailored according to the needs of the patient, though often many other factors are involved in making this choice. Ozurdex has the advantage that the treatment is delivered at longer period of time, reducing burden of disease on patients and clinicians alike. However as Ozurdex is an implant, it is delivered through a thicker needle compared to Anti VEGF agents (Lucentis, Avastin). The Ozurdex implant is therefore more of a traumatic procedure to the eye. Furthermore with repeated implants there is a significant risk of cataract formation which may or may not be bothersome to the patient. Finally eye pressure can increase with these implants and they are not treatment of choice in patients with pre existing eye pressure problems such as glaucoma. Currently both Ozurdex and Lucentis are available on the NHS without restriction for patients suffering from macular oedema in context of vein occlusion. Private companies will fund a certain part of your treatment depending on your level of cover. The advantage would include having a named surgeon deliver your treatment at a time and place convenient to you. The choice of agent, duration of treatment and the financial implications (in case of self funding patients) will be discussed in full at time of consultation.